First look at Jio Smart Phone. Reliance Jio took India by storm when it announced the Jio Phone at its Annual General Meeting earlier this year. 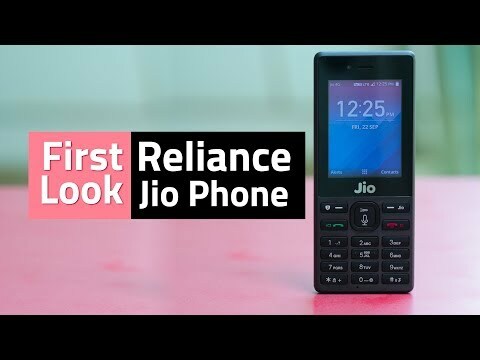 The most exciting thing about this 4G & VoLTE-enabled feature phone is that it is effectively free, because you only need to pay a deposit of Rs. 1,500 which can be returned to you after three years. Reliance opened pre-bookings of the Jio Phone back in August, with deliveries set to start from September 21. We finally managed to get our hands on a Jio Phone and here are our first impressions. 4GB Internal Storage and Expandable Memory Chip upto 128GB. 4G VoLTE Network, Nano SIM Slot and memory chip slot. Screen Size is 2.4 inches (240x320 pixels). 2MP primary camera, VGA front camera. 3.5mm headphone socket, micro usb socket for charging. Running on KaiOS with preinstalled apps i.e. JioMusic, JioTV, JioCinema and more. Expected to get Facebook and Youtube apps. Jio phone has Wi-Fi and Bluetooth along with geolocation. After reviewing lots of smartphones, the Jio Phone feels completely different. It is a feature phone and is built like a standard candybar with a small screen and numeric keypad. It is small and very comfortable to hold; your thumb can reach all corners of the keypad without the need to stretch. Considering its price, we must say that this phone feels well-built. The quality of plastic used is good and the rubber buttons offer good clicky feedback.